Today is pretty much the wrong weather for my Datsun 280Z here in Colorado, but it made Autoblog’s Readers Ride of the Day! Judging by the comments, there are plenty of people who also still love the old Z’s too. I haven’t much touched the car since I bought it other than typical old car maintenance items (for the most part, I like doing all of my own work), so I’ll be kind of interested to see the comments it generates on it’s current state. Sometimes I want to leave it alone, other times I’m ready to do a few minor things to it. For a little more about Autoblog, as far as I know it’s one of the most popular blogs about cars out there (each entry seems to generate tons of comments) and most gearheads who are also interweb nerds seem to read it. As for me, I’ve loved cars as long as I can remember and have owned at least two at a time for the past 8 years or so. Sorry for the spam on the ColdFusion feed, but I had to share. This entry was posted in Culture, Site News and tagged 280Z, autoblog, datsun. Bookmark the permalink. 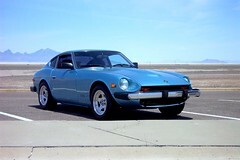 2 Responses to "My Datsun Z: Autoblog Readers Ride of The Day!" My father had a green (with a glitter treatment to it) 280Z. He bought it exactly one year before I was born. It tore him up to sell the vehicle about 10 years ago (approx. 20 yrs of ownership). He took INCREDIBLE car of the vehicle, and it performed marvelously the last ride I took in it (Tampa, FL on a beautiful day). My favorite picture of my childhood has me sitting at the wheel of that car. Now, his brother has a white, slightly younger model, which is in the process of restoration. Wow! That looks just like the one that I used to own. Exact same color! Drove mine until 1990 when it was beginning to fall apart. Lived in San Francisco and, while parked, the Z was the first in a 5-car chain reaction demolition derby put on by an elderly lady who apparently couldn’t distinguish the brake from the gas pedal of her Mercedes. The Z was never the same after the rebuild. I would love to have that car again. I’m 6’7″ and that’s one of the few cars I’ve ever comfortably fit in.